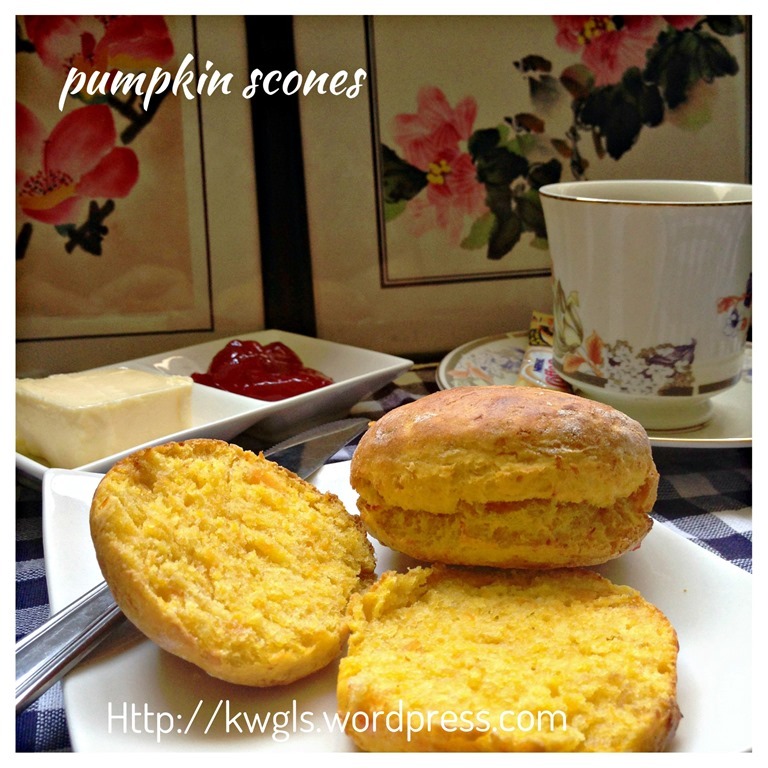 I have always love scones for its simplicity in the ingredients used and awesome taste. 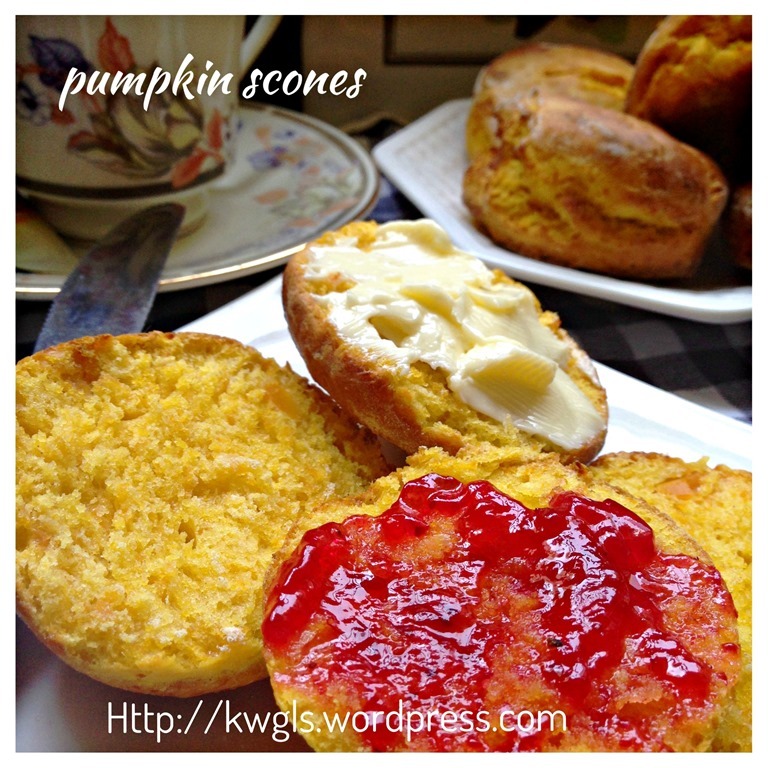 I like to have my scones to go with a big chunk of cold butter，some strawberry jam and occasionally some whipped cream. 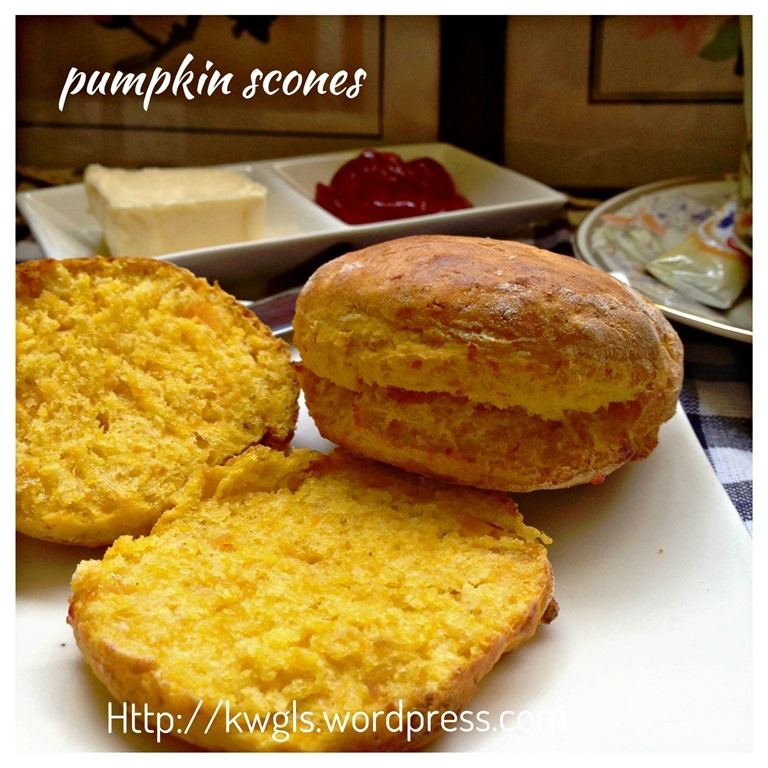 While I was browsing my recipe book, I found this variation of scones – pumpkin scones. 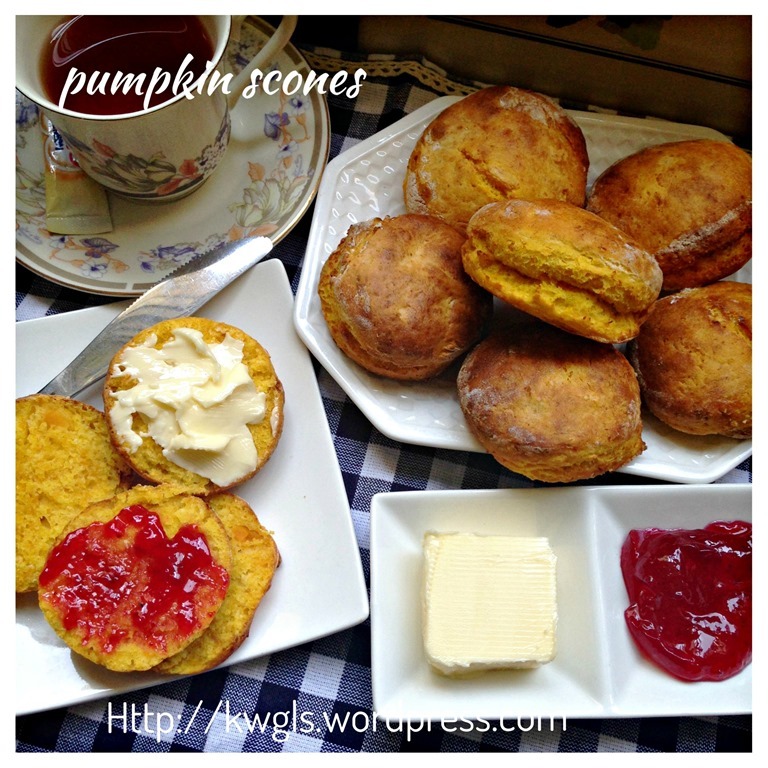 Since I have all the ingredients with me at home, I have decided to prepare these scone for breakfast. 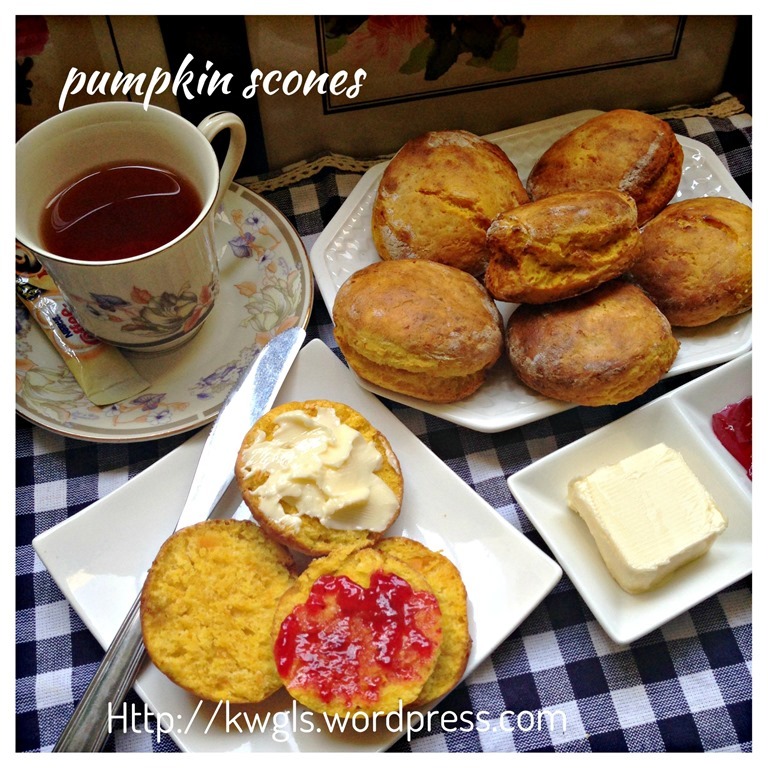 With the addition of the pumpkins, I found that the texture of the scones are much softer and slightly different from the traditional basic scones which are harder and slightly more floury. 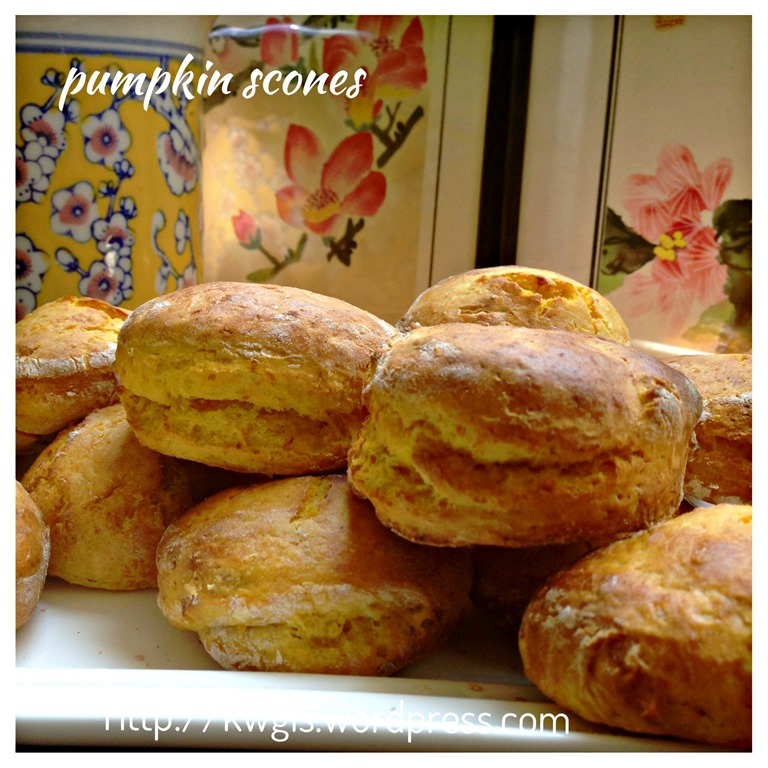 I presumed this softer texture was due to the incorporation of more moistures as a result of adding pumpkin to the scones. In fact, I like this new texture, softer, moister and slightly chewy. It definitely goes well with a cup of coffee and had been my breakfast for two days. Even after two days, It was still as soft as it is. 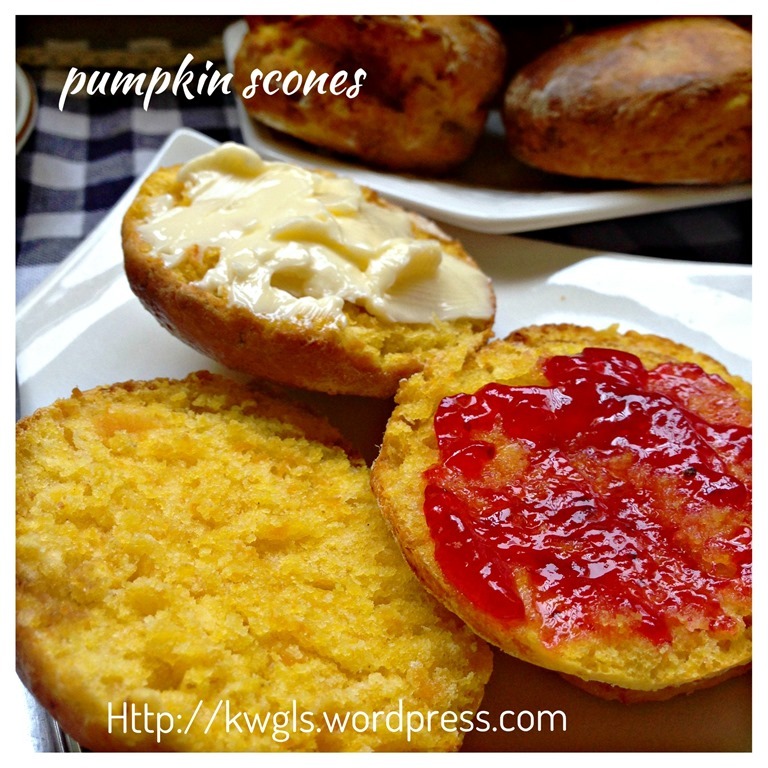 I get this recipe from another old cookbook – “The Essential Baking Cookbook” published by Murdoch Books in 2000, one of my favourite cookbook that have been with me for more than 10 years. 5 cm diameter round cutter. Preheat the oven to 220 degree Celsius and lightly greased a baking tray or line the baking tray with some baking paper. Steamed the pumpkin under high heat until soft (about 10-12 minutes). 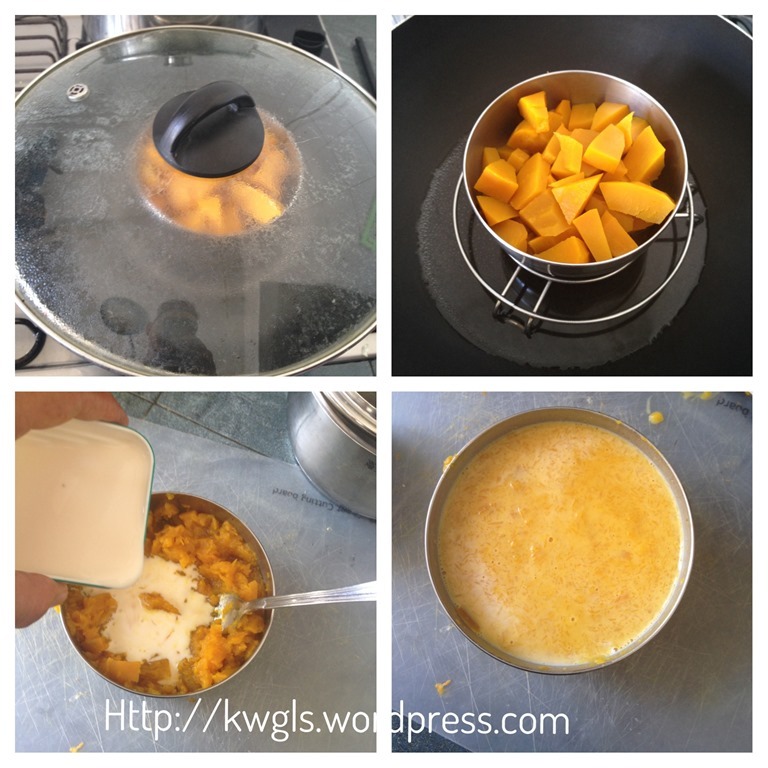 Use a fork to mash the pumpkin until fine and add the milk, stir until well mix. Cool and set aside for later use. In a big mixing bowl, add all the other ingredients except pumpkin and milk. 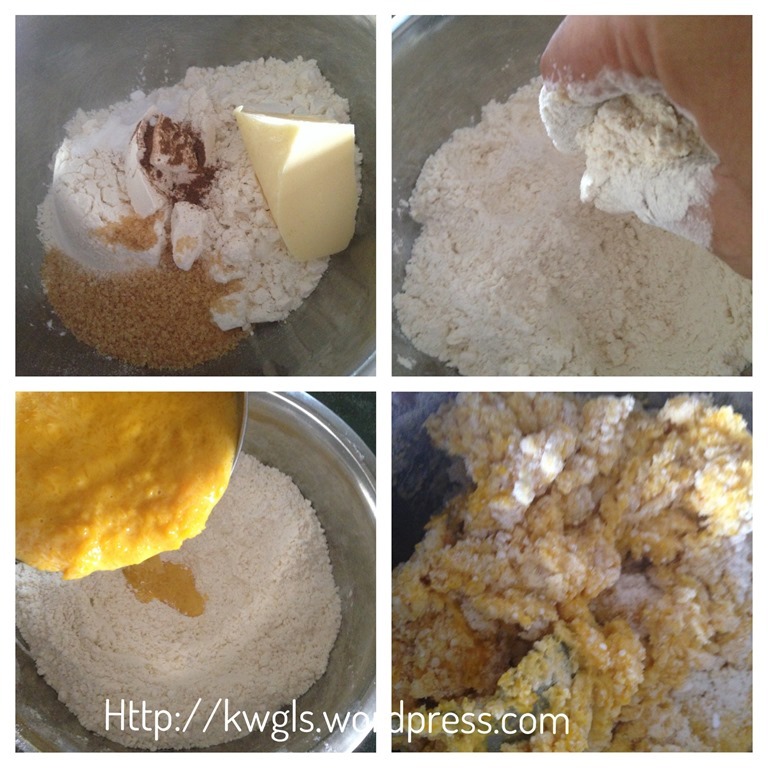 Use hand to rub the butter and flour until some crumble is formed. 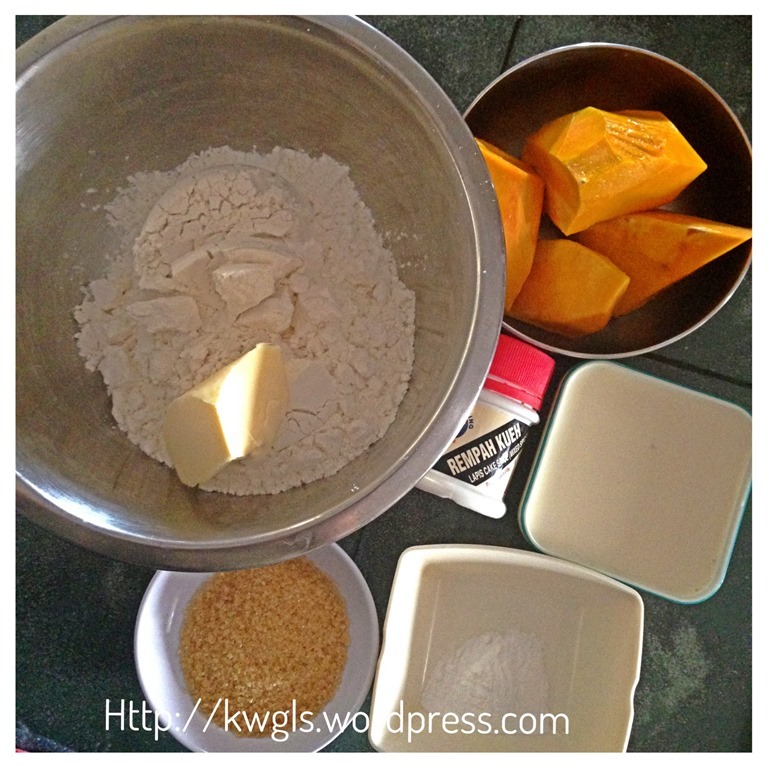 Make a well in the centre, add in the pumpkin and milk mixture. Either use a flat blade knife or a spoon, mix the dough until it comes together in clumps. Transfer the dough to a floured surface and lightly knead for 1-2 minutes. If it is too sticky, add more flour until you can handle it. The handling have to be light. Use a rolling pin to roll the dough flat with about 2 cm thickness. 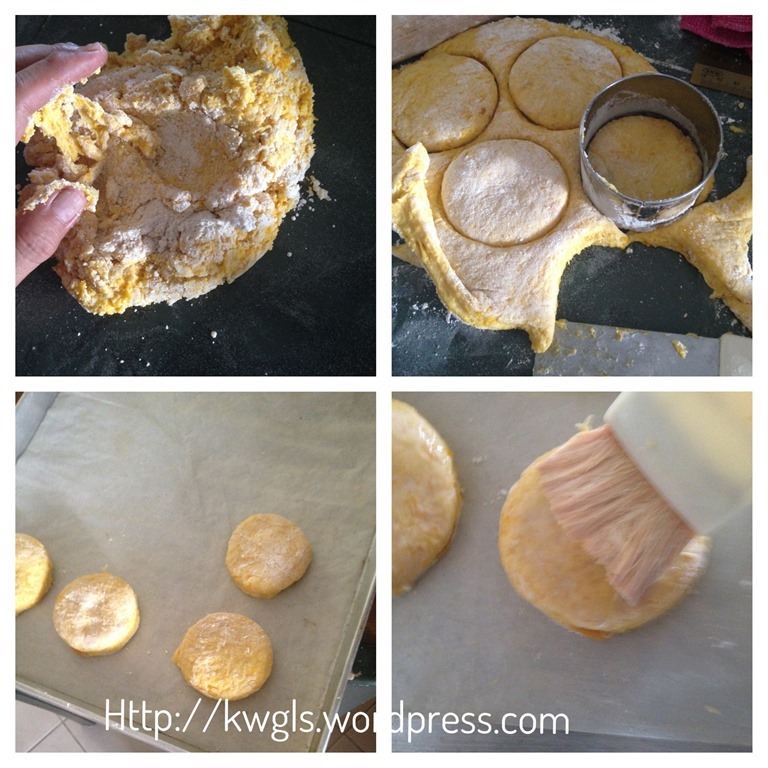 Cut the dough using a 5cm diameter round cutter and transfer to the baking tray. Gather the sides of the remaining dough and perform the same until all the dough have finished. Milk wash the dough lightly and bake in the oven for 12-15 minutes or until well risen and the top turns golden brown. 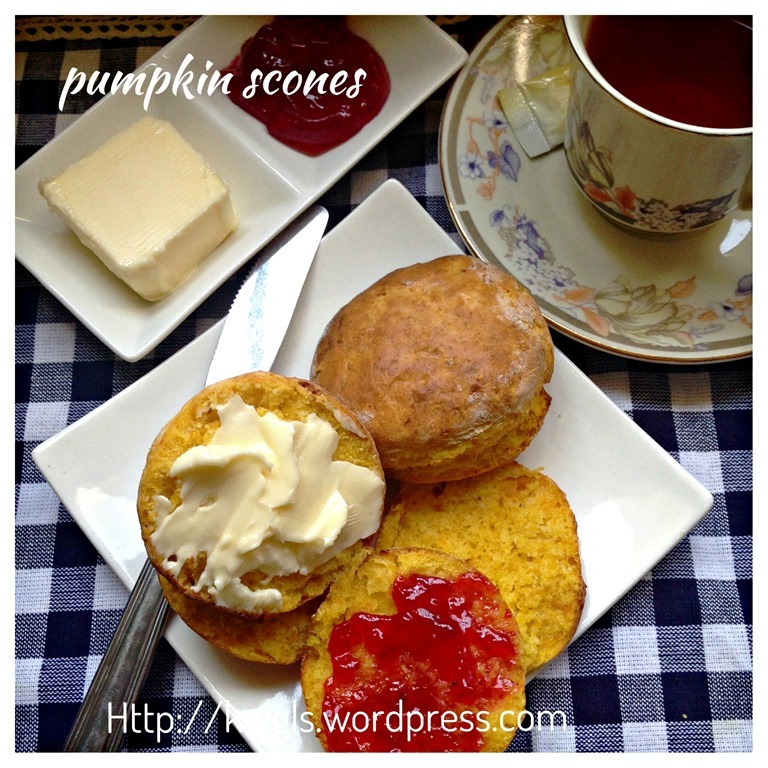 Best served warm with butter, jam or some clotted cream. 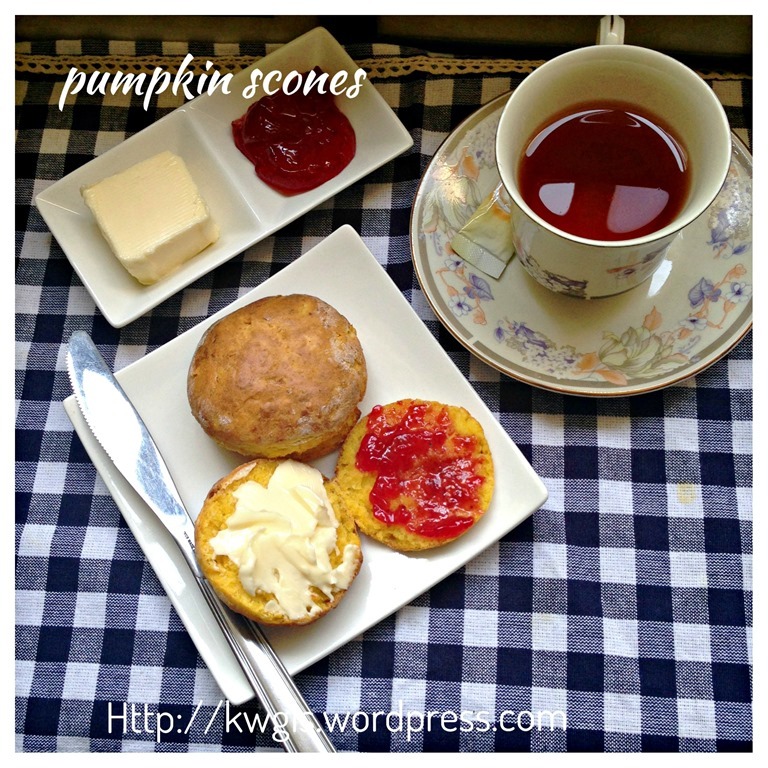 This is a variant from the traditional scone. In fact, I like the softer texture. I can easily have one without any butter and jam. 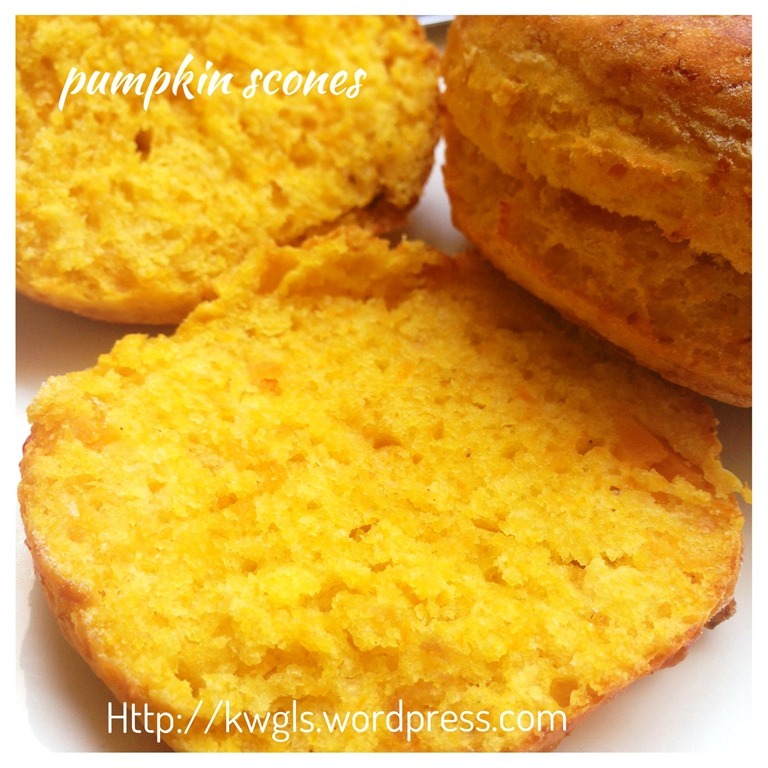 The addition of pumpkin help the dough to retain moistures and hence a softer texture. Do give it a try and I am sure you will like it. 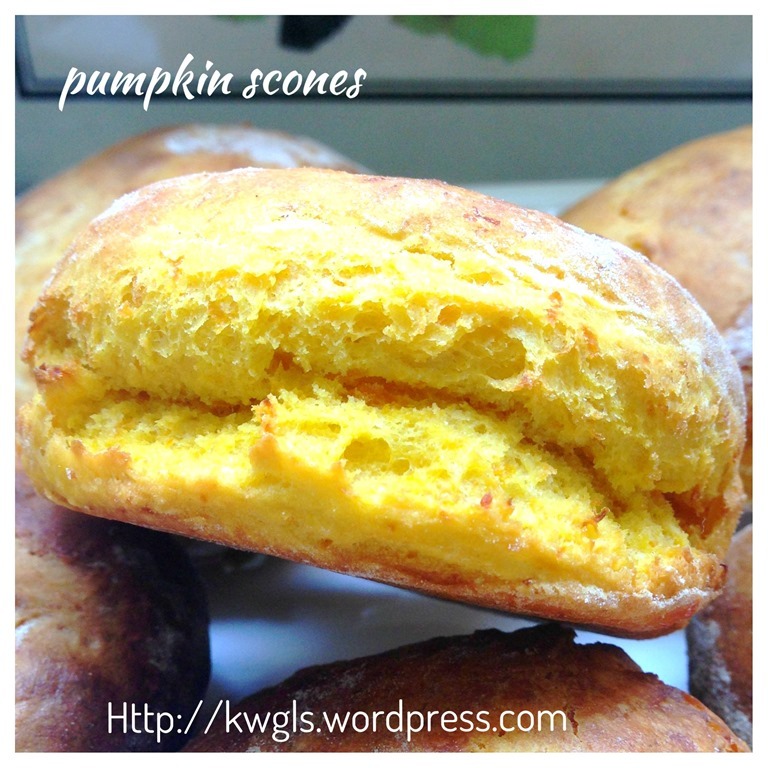 This entry was posted in Breads and Pizza, Cakes and cookies, Food Preparation Series and tagged 8, GUAI SHU SHU, Guaishushu, kenneth goh, postaday, Pumpkin scones, Scones, 南瓜司康饼, 司康饼. Bookmark the permalink.